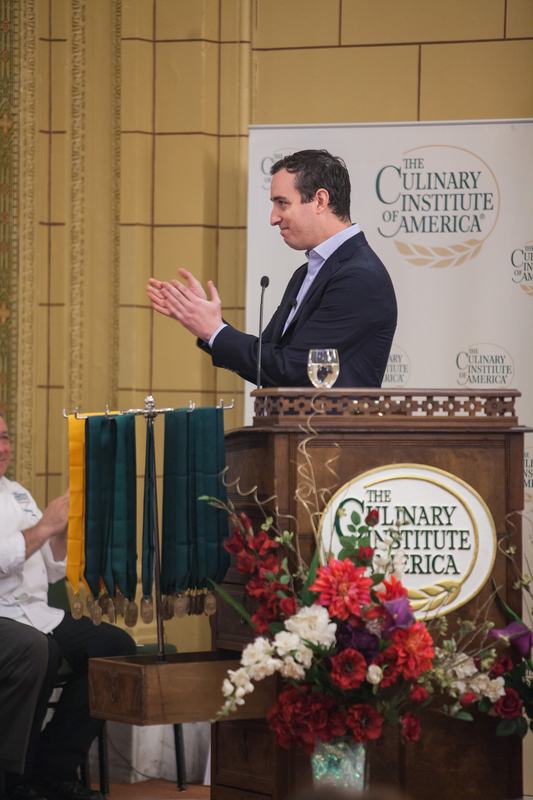 Hyde Park, NY – Will Guidara, general manager and co-owner of acclaimed New York City restaurants Eleven Madison Park and NoMad, delivered the commencement address at The Culinary Institute of America (CIA) in Hyde Park, NY on Friday, February 28. Guidara, named one of 40 Tastemakers to Watch by Forbes magazine last year, told graduates what he learned from two influential people in his life: his father, restaurateur Frank Guidara, and his business partner, Chef Daniel Humm. "From my father, I learned the importance of ambition. To think big and never say, 'I can't.' From Daniel Humm, I learned patience and to appreciate the journey as much—if not more than—the destination," Mr. Guidara said. "Life is a balance between the two. Success is about the combination of knowing you can do anything and knowing that to do anything of real significance takes time." The Hudson Valley native, from Sleepy Hollow, began his restaurant career as a 13-year-old working at a Baskin-Robbins. Wanting to get experience in dining rooms, he became a busboy at Spago Beverly Hills and server at Tribeca Grill in New York City before being hired by Danny Meyer as maître d' at Tabla in New York by age 21. Mr. Guidara became general manager of Eleven Madison Park in 2006. Five years later, he joined with Chef Humm to buy the restaurant from Meyer's Union Square Hospitality Group. In 2011, it won the James Beard Foundation Award for Outstanding Restaurant. Guidara and Humm opened NoMad a year later. Eleven Madison Park was selected as the fifth-best restaurant in the entire world for 2013 on the S.Pellegrino list of the World's 50 Best Restaurants. CIA students can complete their externship field experience at Eleven Madison Park and NoMad, and many of the college's alumni work at both restaurants. "I'm proud of the relationship we've built with the CIA over the years," Guidara told 48 recipients of associate degrees in culinary arts and baking and pastry arts. "It's amazing how many people have joined our team from behind these walls."